I just noticed these billboards popping up around town and thought it useful to give a little info. 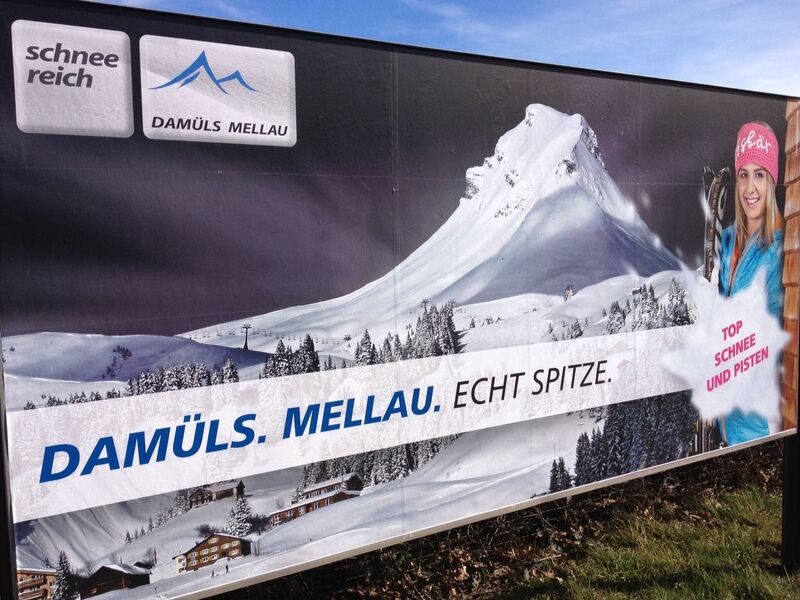 I hadn’t even heard of Damüls until this year, which shows I still have a lot of local knowledge to gain! I was also surprised that the advertisers didn’t try to sell the location a bit more. They seem to assume that everyone knows the ski resort and just need reminding to visit. Damüls was good though. I’m sure it has had better years, but there was still plenty of snow. The runs themselves were not so difficult, no really tough routes, but enough variation to keep beginners and intermediates busy for days. A few too many long flat sections though, so kids get tired. Best part was that there were loads of safe off-piste areas to spice things up. Skiing can be an expensive hobby, but there are some bargain deals to be had. The main costs for a skiing trip are: equipment, hotel, skipass and transport. I can’t help much with equipment other than the tip that if you expect to ski more than 10 days, at least buy a pair of boots. End of season always has lots of bargains in town, or head down to Dornbirn in Austria and get them really cheap. The hotel can be eliminated, and transport and skipass reduced with this simple tip: use the Heini bus and do a day trip to Davos. It picks up from outside the Walhalla at 7:00 and from Blumenwies swimming pool at 7:05. You get your discounted ski-pass on the bus. 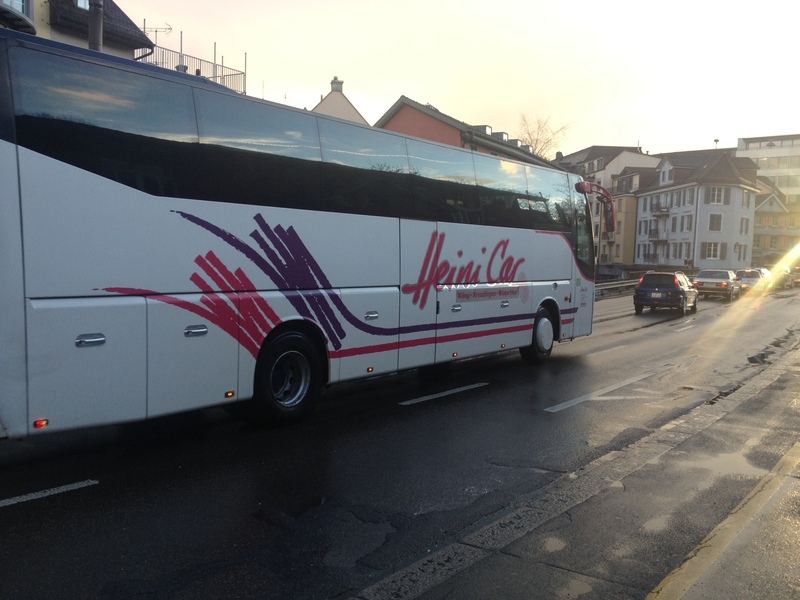 Bus leaves Davos at 16:30 and will have you back by about 19:30. The nice thing about this is that you don’t need to think about parking or that sleepy drive home after a long day on the piste. And you don’t have to settle for a low resort with dubious amounts of snow – Davos has plenty. Contrary to popular belief, this doesn’t have to be ultra-expensive. In St.Gallen, we are blessed with some fairly good ski options within easy reach for a day trip. I find the biggest cost when skiing is hotels! There are beginners options around St.Gallen, but most probably won’t open before Christmas due to a lack of snow. The only one in St.Gallen is St.Georgen and is really only a kids and complete beginners option. Others within easy reach include: Eggersriet & Heiden (120 postbus), Voegelinsegg & Blatten near Speicher (take the Trogenerbahn from Marktplatz) as a start. Lot’s of other little ones dotted around Appenzell. These are all ‘one drag-lift’ options without ski rental. Check the website snow reports before you go as there is no guarantee on snow in the area. Next level would be Ebenalp. Great views and nice restaurant at the top. You’ll get board though if you go often as there are only a few routes down. Takes about 30 minutes by car, an hour by train/bus, and again no ski rental. The best place for beginners is probably Wildhaus. This is the closest proper ski resort, and takes 50 mins by car, 100 mins by train and postbus. There is a ski school, rental shop, and a dozen runs that will keep both adults and kids happy. The best way to get there is by car and there is ample free parking close to the first skilift. Get there early at 8.30ish when the lift first opens on a Sunday and you’ll be able to ski right back to your car at the end of the day. As you go down the Rhein valley, the resorts get bigger, busier, more facilities, and more fun. Flumserberg and Flims are both excellent choices. Davos as well if you can be bothered to go that far. For Flims and Davos though you probably want to stay over night if you don’t have a car. Or use the Heini bus. I’ve done another post explaining more about this option.